PUMA has linked up with pop culture’s cola Pepsi® for an exclusive collaboration that honours 50 years of the iconic PUMA Suede. The anniversary collection has seen the all-time favorite sneakers reimagined in unique iterations by artists, designers, and creators. In the latest Suede 50 collaboration, the iconic beverage is getting in on the celebration with a collectible Suede 50 PUMA x PEPSI capsule. Dating back its origins to the late 1800s, Pepsi celebrates decades of influencing culture and changing the game #ForAllTime. For 120 years, Pepsi has been inextricably linked to and a leader in pop, music, and culture. With huge visibility among athletes, pop icons and musicians around the world, Pepsi has firmly rooted its influence across generations. In the same light, the PUMA Suede has ingrained its status in sport and street culture history as the sneaker #ForAllTime. 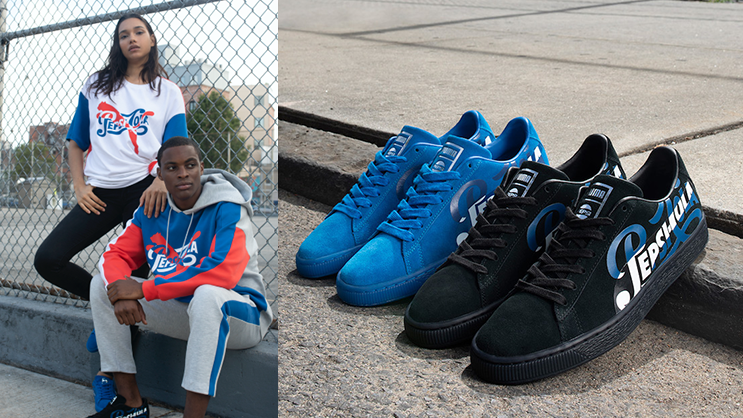 The Suede 50 PUMA x PEPSI sneakers come in two colourways featuring the Pepsi brand colours, Clean Blue-Puma Silver and Puma Black-Puma Silver. Both sneakers feature a velvety suede upper with classic Pepsi-Cola script logo in white and blue over a tone-on-tone Formstrip atop a translucent midsole. The Pepsi logo in silver is debossed on the heel while PUMA and Pepsi branding are stitched on the sneaker tongue. To complete the look, the collection includes a PUMA x PEPSI Pant, Tee and Hoodie in complimenting colours of blue, red, greys and white.